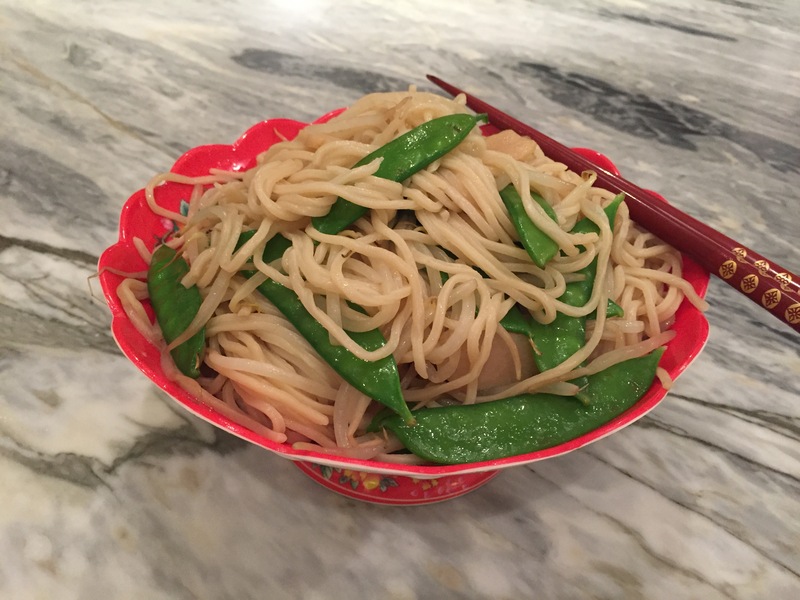 Noodles have long been a part of Chinese cuisine. In fact, back in 2005, a bowl of 4,000 year old noodles was unearthed at an archeological site in northwest China. On birthdays and during Chinese New Year celebrations, Longevity Noodles are often served; the longer the noodle the better, and to be able to eat the noodle without cutting or biting ensures an even better, longer life. 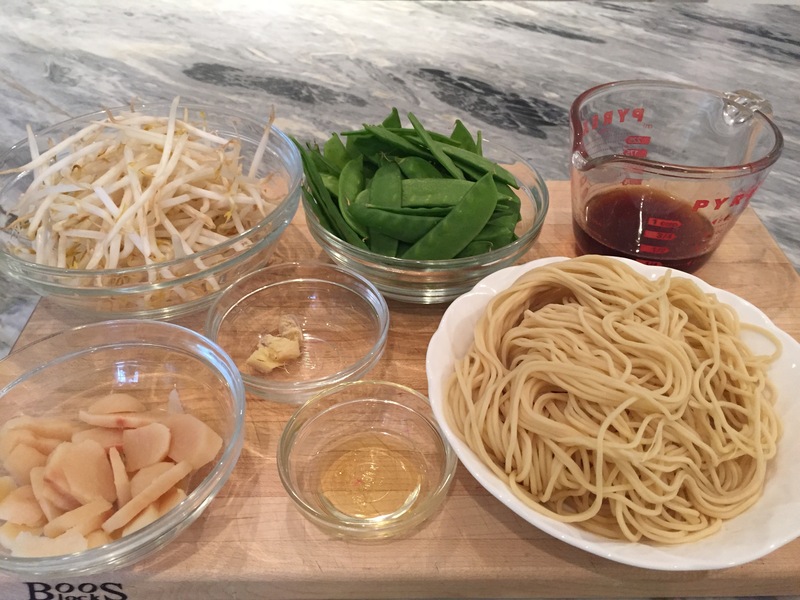 This Longevity Noodle recipe comes from Eileen Yin-Fei Lo, a chef and author of 11 Chinese cookbooks. Tip: The fresh egg noodles are quickly cooked, then rinsed and drained. It’s important that the noodles are drained well, the drier the strands, the better they will absorb the sauce at the end. 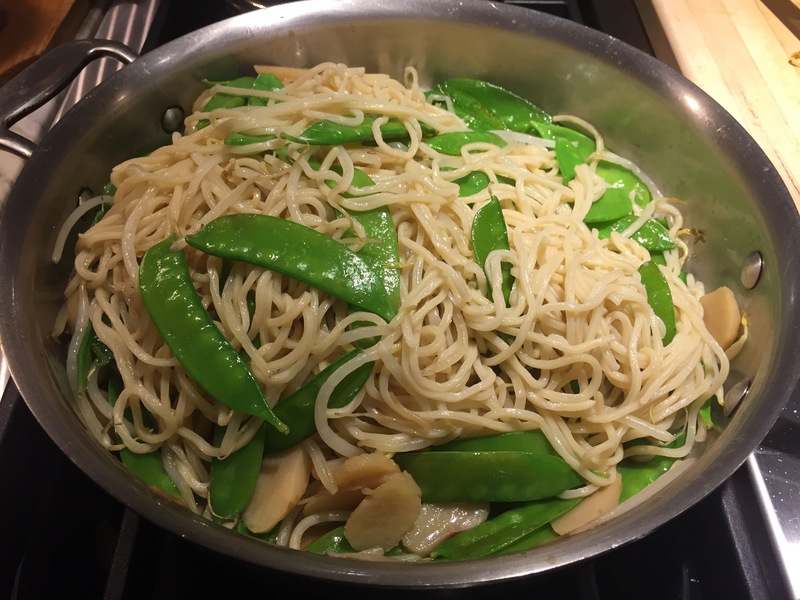 Tip: Once you start stir-frying, the recipe comes together very quickly, literally in minutes. Have everything prepped and ready to go; even the sauce should be made in advance so that all you have to do is pour it in. The Longevity Noodles can be enjoyed on their own or as part of a larger meal. They would be wonderful with grilled chicken, shrimp, or tofu. We enjoyed the dish as is, adding a squeeze of Sriracha and a dash of extra soy sauce at the table. Wishing you a wonderful Year of the Monkey and best wishes for a long and healthy life! Bring the water to a boil in a large saucepan. 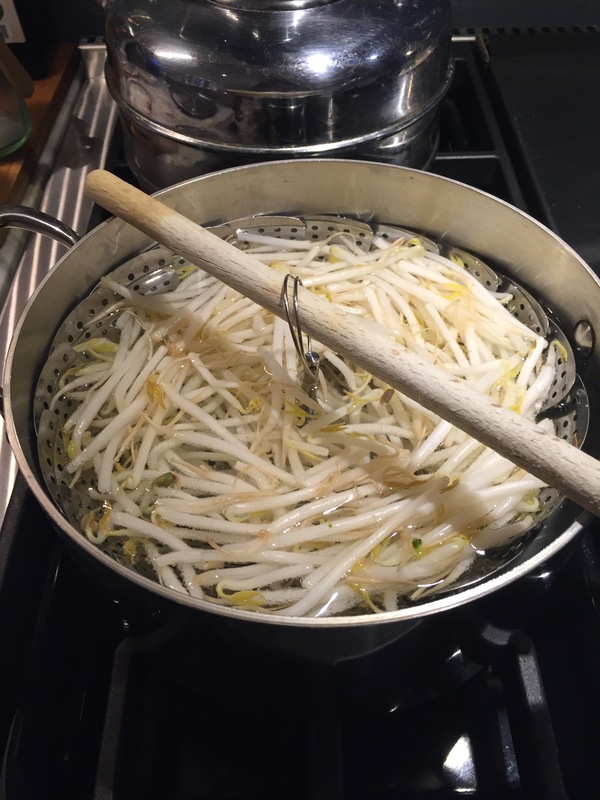 Put bean sprouts in a strainer, lower into the boiling water and blanch for 10 seconds. Remove the strainer and rinse the sprouts in cold water; drain well. Add salt to the water in the sauce and bring back to a boil. Add the noodles and cook, stirring for 1 minute. Drain the noodles thoroughly in a colander and rinse them in cold water and drain. Rinse again, then drain, lifting them carefully to separate and dry the strands. In a small bowl combine the chicken stock with the soy sauce and sesame oil to make the sauce. Warm a large skillet or wok over high heat for 45 seconds. Add the peanut oil and swirl to coat the skillet. Stir in the ginger and cook for 10 seconds. 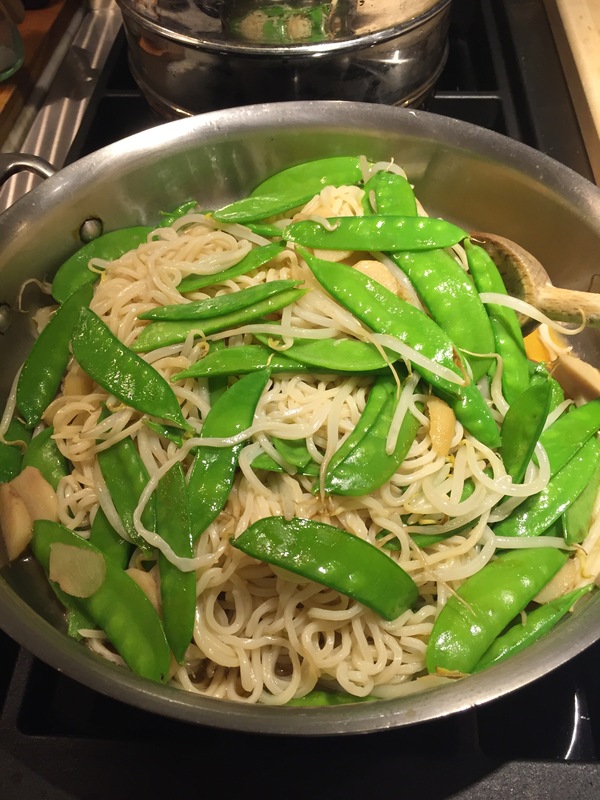 Add the snow peas and stir-fry until bright green, about 1 minute. Add the water chestnuts and stir-fry for 30 seconds. 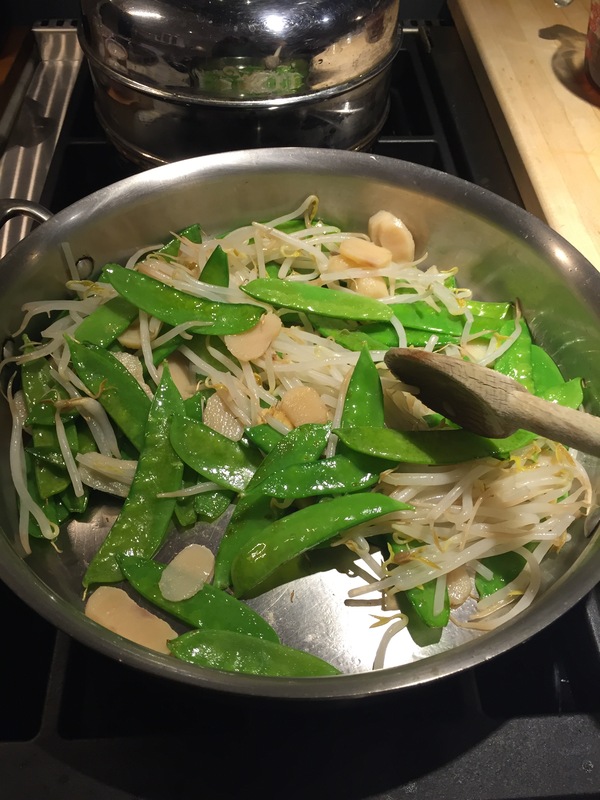 Add the bean sprouts and stir-fry for 1 minute. Stir the sauce, then add it to the skillet and bring to a boil. Add the noodles and stir-fry until they absorb the sauce, about 2 minutes. Transfer noodles to a platter and serve immediately with Sriracha and soy sauce for passing. Prep and gather all your ingredients, including making the sauce. This recipe comes together in minutes, so it’s important to have everything at the ready. Blanch the bean sprouts for 10 seconds. Remove strainer from water and rinse sprouts under cold water. Drain well. Add salt and bring the water back to the boil. Add noodles. Cook noodles for 1 minutes, stirring occasionally. Remove noodles from water. Drain and rinse under cool water. Drain. Rinse again, gently pulling noodles apart to separate strands. Drain throughly and allow to dry slightly. 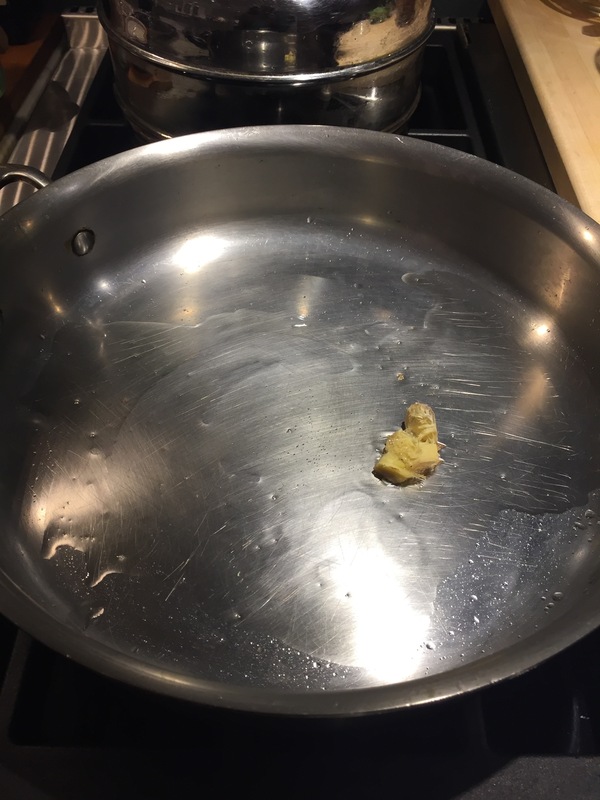 Warm a skillet or wok over high heat for 45 seconds. 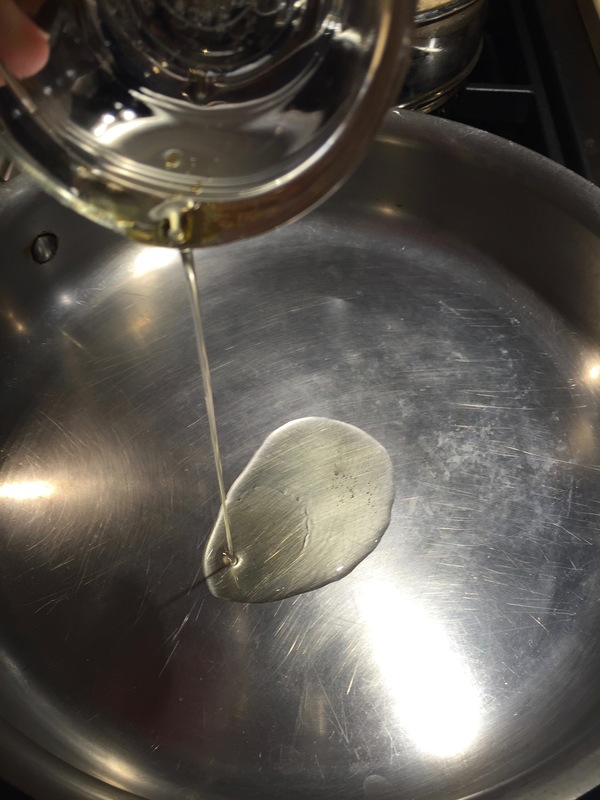 Add peanut oil and swirl to coat pan. Add ginger and cook for 10 seconds. 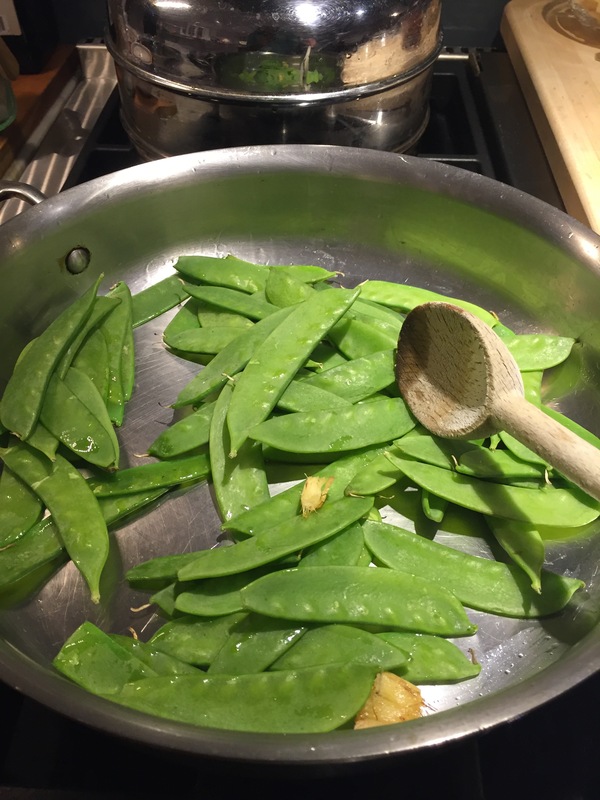 Add snow peas and stir-fry until bright green, about 1 minute. Add the sliced water chestnuts, and stir-fry for 30 seconds. 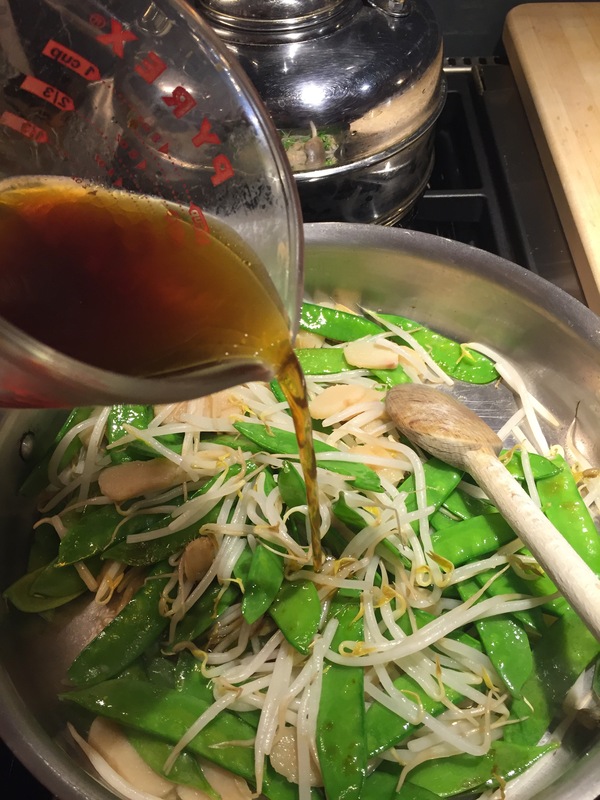 Add the bean sprouts, and stir-fry for 1 minute. Stir the sauce, add it to the wok and bring to a boil. Add the noodles and stir-fry until they absorb the sauce, about 2 minutes. Yummy! This may have to go on our menu for Chinese New Year! There they are, love those looooonnnng noodles. They look wonderful, were they hard to make? Haha! Super long noodles! Very easy to make… it all came together in less than 30 minutes. I found the noodles in the refrigerated section of the grocery store, right next to the fresh wonton wrappers. The brand was Nasoya. Thank you! And so so easy to make! Hope you and your family enjoy it! I love the history and info. you are giving us Jean! Wow these look very yummy! Thanks, Lynn! I’m glad you like the info… it’s fun to learn about about different cultures, especially through food! A bowl of these noodles sound so good to me right now! They sure look delicious, Jean. I think I would add some meat of some description but change nothing, it looks really tasty. Thanks, Cameron! Adding meat or another protein would really make this a complete meal. You could also bump up the amount of veggies as well. All in all, very good and very quick to get from stove to table; plus the added bonus of a ensuring a good long life! I shall definitely be trying it. Without doubt!! Thank you, Terry! I’m so glad you enjoyed the read. Hope you’re weekend is going well! These noodles look really good, and I love the water chestnuts. This is so interesting! 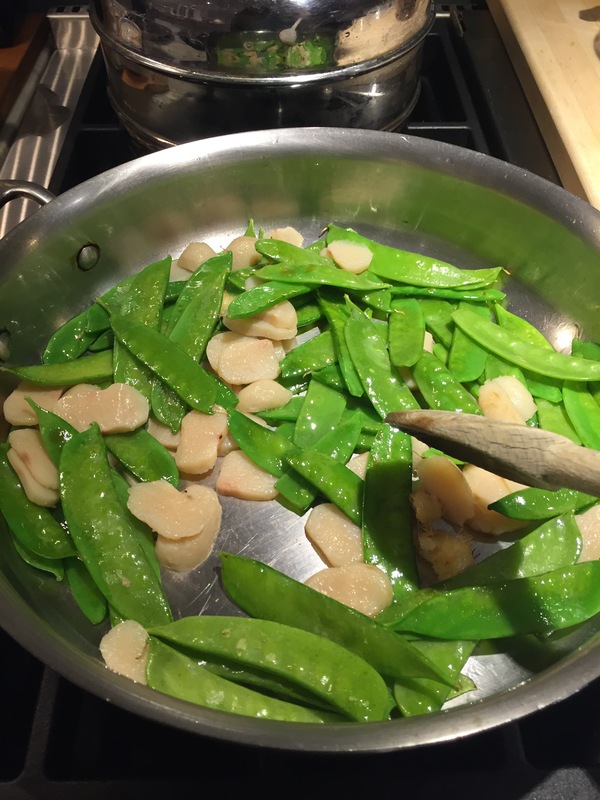 The water chestnuts add such a great crunch! Thank you, Antonia! This looks so good, particularly with the bean sprouts and water chestnuts. I enjoyed reading the little bit of historical information about Longevity Noodles, too. Thank you, Millie! The bean sprouts and water chestnuts add a really nice crunch! Ooh! Great flavors for a great dish! Time to get out my chopsticks! Looks delicious. I’m a sucker for sesame oil and would probably double it. Otherwise no changes. Yum, these look great. 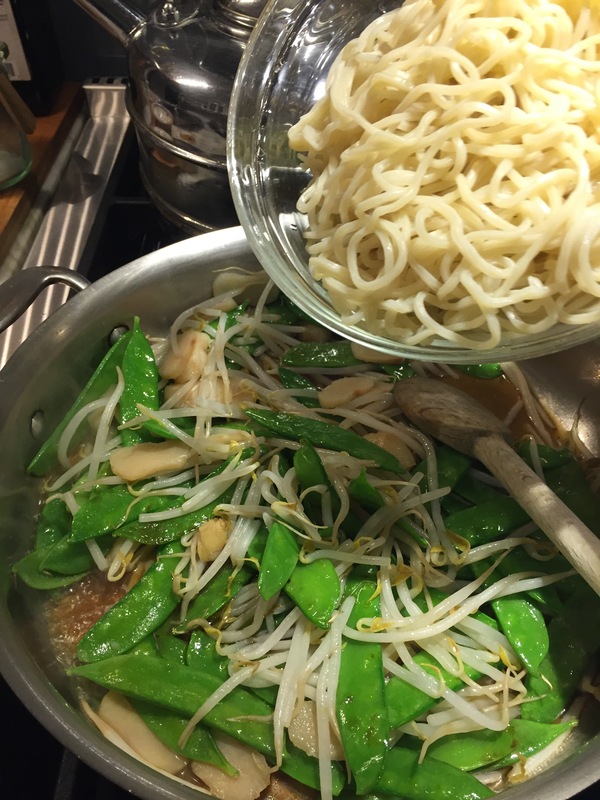 I like the photo of how you blanched the bean sprouts–I’ve never seen the strainer hung across the pot like that. Very smart! I usually only use that as a steamer basket at the bottom of a pot. For blanching I’m usually fishing stuff out of the pot, or dumping into a strainer and dirtying a second pot if I need to save the boiling water. This saves a step for sure. I know exactly what you mean! I actually threaded the wooden spoon through the loop as a way to pick up the basket without burning myself on the metal loop. Necessity is the mother of invention! I love that, and I’m going to try it next time I need to blanch a few things!